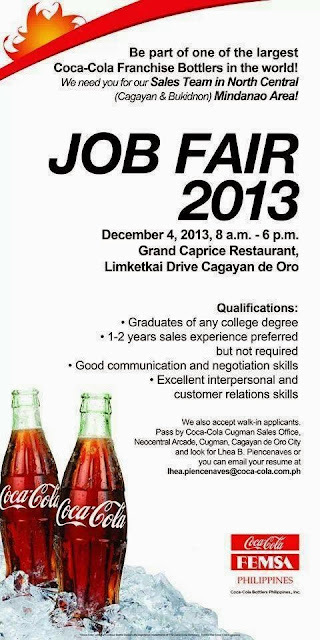 Good news jobseekers! Another Job Fair is coming your way. Coca-Cola Bottlers Philippines, Inc. is in need for Sales Team for North Central (Cagayan de Oro and Bukidnon) Mindanao Area. The Job Fair will be held on December 04, 2013 from 8 AM until 6 PM at Grand Caprice Restaurant, Limketkai Drive, Cagayan de Oro City. Please see the image below for the qualifications. Prepare yourselves and bring your credentials. Who knows? You might be in one of their sales team. God bless jobseekers!